In December, 2016, the Department of Energy announced the establishment of the 10th Manufacturing USA Institute, representing a critical step in the federal government’s effort to double U.S. energy productivity by 2030. The Rapid Advancement in Process Intensification Deployment (RAPID) Institute is focused on addressing the barriers listed above to enable the development of breakthrough technologies to boost energy productivity and energy efficiency through manufacturing processes in industries such oil and gas, pulp and paper and various domestic chemical manufacturers. 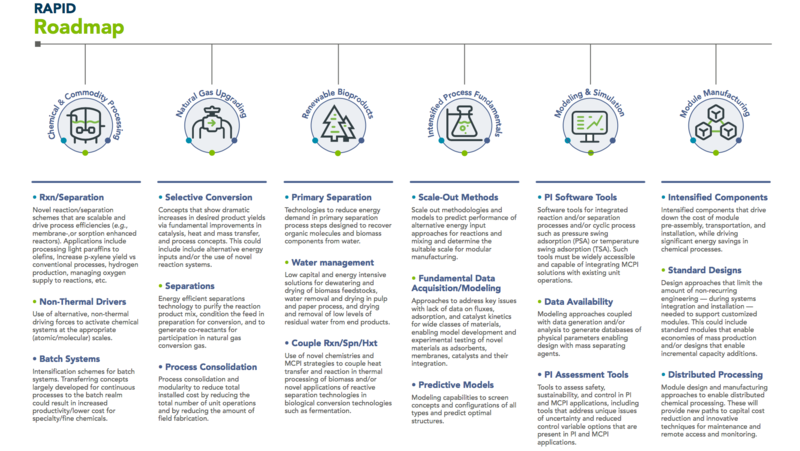 RAPID will leverage approaches to modular chemical process intensification (MCPI) — such as combining multiple process steps such as mixing, reaction, and separation into single more complex and intensified processes — with the goal of improving productivity and efficiency, cutting operating costs, and reducing waste. What is Modular Chemical Process Intensification? Advances in hardware and control strategies to combine multiple process steps into a single unit (e.g., membrane reactors for reactive separation to deal with chemical equilibrium constraints and divided wall columns to replace multiple individual units). Such processes have the potential to reduce capital costs through a reduction in distinct process steps and also the potential to improve energy effciency by reducing recycle streams and improving on heat/mass transfer inefficiencies created by the use of stand-alone process steps. Application of significantly enhanced driving forces — both chemical and physical — to drive chemical and transport processes. This would include the use of rotation to enhance buoyancy driven processes and the use of non-traditional energy sources to drive heat, mass, and momentum transport (e.g., ultrasonic mixing, microwave heating, etc.). You can learn more about the roadmapping process for the RAPID Manufacturing Institute by downloading the PDF below.